Break out the bunting - The Great British Bake Off is back. Twelve contestants are taking to the tent for the first time in the launch episode, which was shown on Channel 4 on Tuesday night. It's the first time GBBO is being broadcast on the channel, having previously been on the BBC since its inception. As well as the bakers competing to win the show, there are new presenters in the form of Sandi Toksvig and Noel Fielding and a new judge - Prue Leith. Paul Hollywood is the only original member of the gang to return. What do the critics make of C4's GBBO? So who are the dozen hoping to dazzle with their dough and show prowess with their pastry? A software developer, cancer survivor and budding sailor, Chris became a Bake Off fan while recovering in hospital. He's interested in the science behind baking and is nicknamed Heston Blumenthal by his friends thanks to his quirky flavour combinations. The oldest Bake Off contestant to date used to work in a sausage factory, which is where she met her late husband Richard. When he died two years ago, she was encouraged to take up baking again for both family members and her son Stephen's restaurant. Outside of the kitchen, she enjoys singing karaoke and having the occasional boogie with friends. James describes himself as a bald, baking banker with a bad back and says he's always up for a challenge. He trained as a port diver for the Royal Navy Reserves and uses the fruit and veg he grows on his allotment in his bakes. James, who was taught to bake by his dad more than 40 years ago, is a father himself to two sons. He and his wife Ann also have three chickens, called Sparkles, Superman and Jeff. Originally from Kemerovo in Siberia, Julia moved to the UK three years ago to live with her British husband Matt. She taught herself to bake at a young age and gave up her job when she won a place in the tent so she could commit all her time to the show. As well as being a health and safety inspector, a blacksmith, a furniture restorer and a yoga enthusiast, Kate is a self-taught baker with a passion for old-fashioned techniques. She started to bake two years ago when she started growing her own vegetables and describes being inside the GBBO tent as a life-changing experience. Known among his friends as the cake boy, Liam was born in Hackney in north London and is studying drama at university. He discovered his passion for baking four years ago and is keen to help make baking more acceptable among his peers. Peter was born in Brixton in south London, moved to Nigeria when he was seven and moved back to the UK when he was 24. Now an IT programme manager, he lives a health-conscious life in Essex with his wife Tito and their two children. Peter started making his own bread eight years ago and has never looked back. When not baking, he enjoys badminton, running, spinning and chess. A psychology graduate, former Royal Artillery officer and trainee stuntwoman, Sophie discovered she had a talent in the kitchen after volunteering to make a friend's birthday cake. When not baking, she enjoys track cycling, rowing and teaching military boot camps. Former school teacher Stacey likes to express her Jewish heritage through her cooking. As a child she helped her grandmother make bread and butter pudding. Now married with three young sons, she continues the tradition by making a home-made challah loaf for dinner every Friday. Steven was taught the basics of baking by his mother Judi 25 years ago and now cooks and bakes everything he eats. He has a background in marketing but is considering giving it up to focus on baking full-time. Architect Tom was taught to bake by his mother June and can regularly be found at home cooking for his partner David. He loves being outside as well, with other interests including rugby, triathlons, skiing, horse riding, hiking and fresh water swimming. Born in Hong Kong, Yan moved to the UK when she was two and eventually trained as a biomedical scientist. She turned her attention to baking 10 years ago to fill in the time between her shifts as a molecular biologist for the NHS. 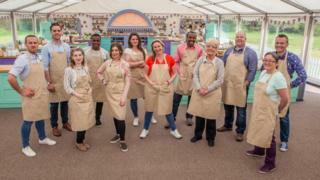 The Great British Bake Off begins on Channel 4 on Tuesday 29 August at 20:00 BST. What do the critics make of Channel 4's The Great British Bake Off?